Yes, apparently they are very conductive ha ha! I'm just waiting for 4 LH R1 points to complete the track-work into my station. Then I have to sort out the wiring! I was hoping to buy a house in France and have another garden railway over there. It would have been nice to have the odd visiting enthusiast. Methinks I should cross you off the invite list - just in case! Well, if the locals will walk all over the track! pre-cooked frog's legs? Thought that was a delicacy? Ah, but, I have French blood from my Mother's side of the family? And Dutch from my Father's side. Next you'll be telling me you have a surfeit of 'zee leetle grey cells'. Where do you keep it? In the fridge? So they've actually croaked it? My LH points arrived today and have temporarily been installed. The attached photograph shows how I have laid out my track to give me just what I envisaged. All trains in the station can arrive or depart from both lines leading out via the curves. It would of course be somewhat more compact had I installed a double slip (and might even have been less expensive!). Without incurring too much of members wrath Where do I put my DPDT please? If the worse comes to the worse I'll just use my Playmobil RC locomotives. then you attach your dpdt between the mainline rails and any 2 rails in the insulated section. You are correct in your assumption. So by putting in the insulated joiners as you say all of the station tracks will be isolated from the main line (my continuous run). Please confirm the purpose of the DPDT switch. It is to maintain the correct polarity to the rails between the main line and the station? Simply feed one end of the DPDT with wires from the left hand side of the insulated joint, and from the right hand side to the other end of the switch. Then use the feed out of the centre of the switch to power your sidings. You have a "reversing loop", which means there are situations where the polarity of the tracks on either side of the insulators do not match. So you power the "reversing loop" with a switch that can reverse the polarity AS NEEDED... of course I also suggested you add an LED so you can tell when you need to throw the switch. You said you had this working before... if you have the switch set wrong, you will cause a short through the loco. Your DCC system SHOULD trip it's breaker in this situation. Therefore you need to determine which switch position is needed to "match" which of the 2 switches you are traversing from the main to your "station". p.s. it might be worth re-reading the extensive thread we did on this before. in' for later on. I've done just that on the Taita Gorge Railway. I'll dig out the page numbers for you to have a look at. Edit. Check out posts 226 on p.12, and 261 on p14 of Taita Gorge Railway. This morning weather forecast gave a 30% chance of rain and the radar showed just a small indication which we have just had. So, I take the feed for power to my station through a DPDT switch from the main line. 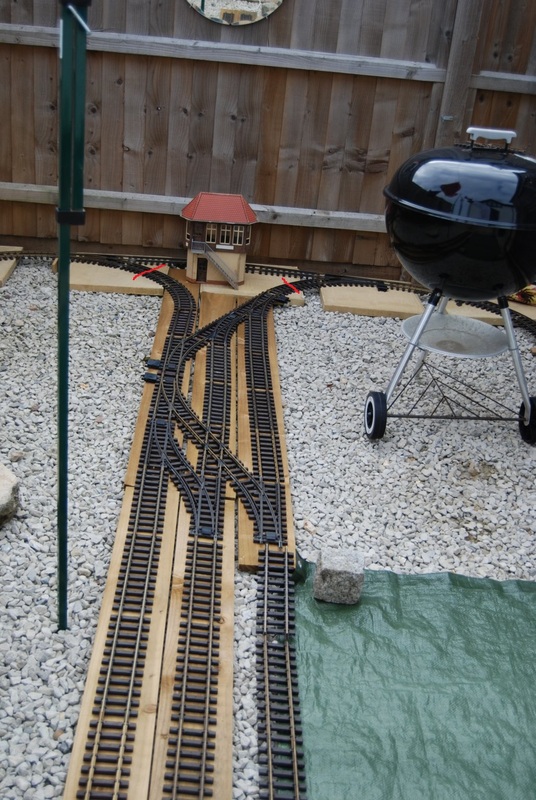 I install the switch in-line with the track so I will know which way round my main line the power will drive my locomotive? Sounds simple! Greg, I'll consider the LED's once I understand.